Our culture has its own quirks, whether we notice them or not – in fact, the ones we are blissfully unaware of are the ones that have the potential to make the most silent impact. Our language defines us, whether we choose to let it or not. In our first few months of life, billions of synapses form in our brain and the ones we don’t use gradually fade. We have the ability to speak any language when we’re born but by the time we’re a few years old, if we haven’t heard certain sounds or words, they become more difficult to learn later on. This becomes a grounding principle when we realise that our words are our primary means of expression. It is one of life’s great mysteries: the feelings, emotions and experiences that we don’t have words to describe. It is why music is so formative – it transcends language and can speak and evoke response without the need for words. But words are also telling – if we have many words for something, we value it enough to try to describe it as best we can. For example, we have one word for rice. To us, it’s rice whether it’s in the field, in a bag or on a plate. But in Asia, you have padi, beras and nasi – the distinction between each is important enough to those who speak that language to make sure they are adequately represented. So why is it that we only have one word for love? And one word for happiness? It is a feeling that is so profound and important that the Greeks gave it its own word. Our expectation of one word being able to sum up our current emotion and the important things in our life, also influences how we interpret phrases and whole sentences. I will continue to enjoy those moments that words cannot describe and appreciate them for their awe-someness. I will also continue trying my best to use the words at my disposal to articulate thoughts and emotions. All the while, I acknowledge that sometimes, I need to experience and see beyond the words to the indescribable beauty of life and truth in the Bible and all around me every day. There is a wonderful quote by C.S. Lewis that reminds us of the importance of keeping vision, direction and interests in your life. So, what are you sharing and where are you going today? And who’s travelling alongside you? This verse has had layers of meaning added to it over recent weeks. It has popped up often in my quiet times, in conversation and at a conference I went to recently. It reminds me that no matter what I may do and say, no matter what priorities push to the fore and no matter what stage of life I am at, there is one thing that remains the same: I serve the Lord. Regardless of the goals I have for myself, for us as a couple or for our future family, we serve the One who made us. It is a declaration over my household and to all who enter that we are made to live for God and it is a challenge to me to make time in my daily schedule to spend time with my Father to bring my perspective in line with His. When I do that, the definition of a life well lived is realigned and falls according to how willingly I’m bringing God into my every day. Joshua knew where his allegiance lay. He was speaking to God’s chosen people and even they had forgotten the great I Am and all that He had done for them. There was no shame in Joshua’s declaration. For me, it is a promise not only for myself but for my family, that those who live under our roof serve the Lord and as such, our relationship with Him becomes our priority. There is so much I could write about our time in Hawaii. I could dwell on the simplicity of sun, sea and sand and the positive impact they can have on your soul. I could reflect on how time spent on an island that is six hours from the nearest mainland can really give you space to take stock and figure a few things out. I could tell you that these islands are a merging of Polynesian and American cultures and unpack how that gives them a unique atmosphere. I could quite happily recount how excited I was that my name – one that is Hawaiian in origin – was everywhere and how when I told my name to the baristas in Starbucks, they didn’t ask me to repeat it or how to spell it when they wrote it on my cup. There is so much I could write. It is that very phrase that as a communicator, I was excited to see ‘in the flesh’. Imagine my surprise when I saw that the phrase, which in itself lives in infamy, was written in pencil over the original script. These famous words were not those that were intended to be spoken. 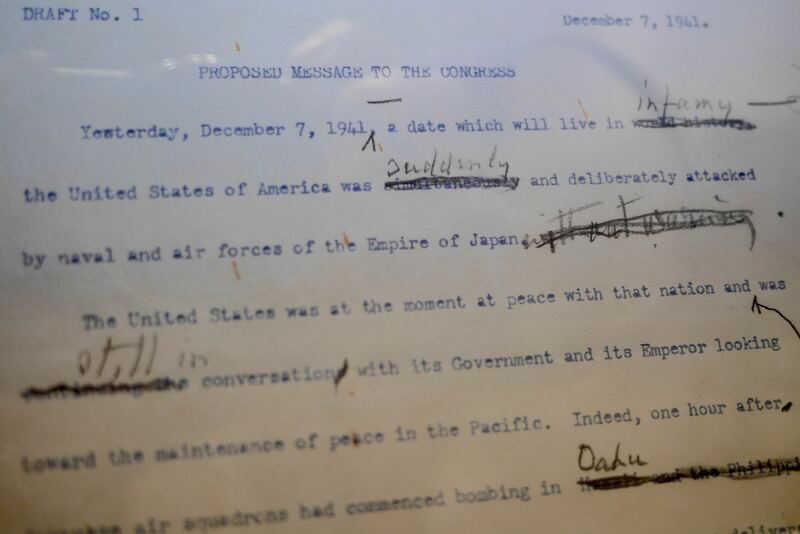 They were an amend, seemingly written by the hand of Franklin D. Roosevelt himself and they were displayed in the museum at Pearl Harbor. The power of words is something that I am all too aware of. When used in spite, the spoken word can hurt more deeply and make a longer lasting impression than any physical wound. When used in triumph, the spoken word cannot be matched in its ability to inspire and transform generations. So it is with this one word. Yes, 7 December 1941 was a date that became part of world history. But with that small pencilled correction it graduated beyond being a date that is simply recited by youngsters in a history class and became a date that changed the course of history. A date that, because of a President’s understanding of the power of language, lives in infamy. “I believe in the sun, even when it is not shining. “I believe in love, even though I don’t feel it.